AREMI makes it easier for renewable energy projects to get off the ground in Australia. We provide a ‘one stop shop’ for all open geospatial data relevant to the energy sector from government, industry and research. 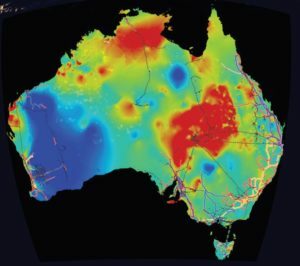 Energy project developers can freely access spatial information such as existing electricity infrastructure to assist with site identification. State and local governments can use the open data AREMI provides to assist with environmental and regulatory planning approvals, and tracking and promoting projects in their region. The AREMI platform enables financiers and investors to explore the potential success of proposed ventures. AREMI also acts as a repository for ARENA-funded mapping projects to enable their access in one consolidated location. and land use data from Geoscience Australia; water and climate data from the Bureau of Meteorology; solar data from other ARENA projects; and statistics from the Australia Bureau of Statistics. Users can overlay multiple data sets such as population, infrastructure, power utilities and protected habitats or even their own internal data services. Relying on the strong geospatial visualisation skills at Data61, the front-end of the software uses Cesium, an open source WebGL virtual globe and map engine, which is developed by Data61 alongside other organisations. AREMI is available at www.nationalmap.gov.au/renewables. Development will continue until July 2016 and Geoscience Australia are hosting AREMI until at least July 2019. Data61’s team of software engineers and user experience designers, in collaboration with the Clean Energy Council, have a strong consultation process with continuous user feedback to ensure the site provides relevant information – to provide feedback please contact our team (details below right). Data61 has partnered with Geoscience Australia and the Clean Energy Council on the AREMI project. Geoscience Australia provides hosting for the platform, while the Clean Energy Council fulfils the role of industry liaison partner. ARENA will provide up to $2.1 million in funding towards the project. AREMI is led by the Data61 Environment Business Team, developing leading edge predictive analytics and spatial visualisation tools for improved environmental resource management.